This is what happens when kids never fail due to helicopter parents and participation trophies. THESE were our ‘participation’ trophies back in the day, and those who are serving today. Don’t forget this one. Some of us are still around. Of course, I’m just about the youngest guy to get one. It bothers me a little bit to see that military award pins are for sale at WalMart. I can beat you with an Armed Forces Expeditionary Medal for Korea from 1974 or so, the last year they were giving it for tours in Korea. To go along with the Vietnam Campaign with 70 device, and Service medals, I picked up for HHC 29th Sig Gp, 1st Sig Bde in Thailand 70-72. Amen, and thanks to all y’all. My cousin has done that. My participation trophy was the National Defense Medal and a DD214. And I would do it again. My thanks to all of you who served. Never served, but had to do the crashed helicopter escape drills so I could work on the oil drilling & production platforms. Fully clothed and in the dark. I have no idea how nobody drowned that day. That was the point of “panic in a drum” training, to show that you could make it out if you reacted correctly as taught. As scary as the trainer was, the real deal would have been a lot scarier if it was the first time you got wet. …and tough as that bit was, there were highlights – the lifeboat launch from 50 metres up into, and under, the harbour was better than any roller coaster ride. Hehe. I always called the NDSM the participation medal. I got the GWOT-S and the GWOT-E, right before they quit awarding the Expeditionary one in favor of the OIF/OEF campaign medals. I got one of those, too. 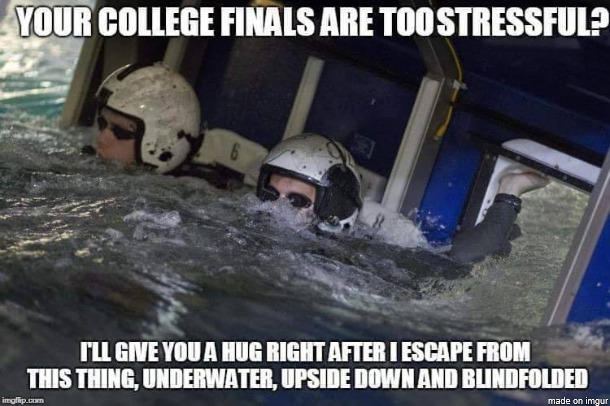 That being said, there were times in college, mainly calculus, that made me miss being a dumbass grunt. CP- You were there, that counts. I remember one social studies teacher. in ’79, a short tubby guy, picking up one of the students and physically throwing him out of the room. Door gunners, never mess with door gunners. The older I get, the more I think teachers need to be veterans. But then again, I am a grumpy old fart. Thank you all who served for your service. And remember, if you’ve served in Korea after the cease fire, you are still a veteran of the Korean War. Maybe one day, hopefully soon, that war will finally be over. If we’re doing challenge medals, I’ve got the World War II Army of Occupation Medal for service in Berlin (85-87). Beat THAT! Would a Medal of Honor bet it? never got one, just asking. Different kind of contest. This game is about service medals, not valor awards. I suspect the Big Joker would be the Antarctica Service Medal with Wintered Over clasp. I got the Ormy of Occupation metal for Berlin from 1987 Field Station Berlin, and I got the SWA participation metal, LOL….Would do it all over again if I could. Got’ the one on the left + the green and white one + the “Geedunk Medal! !”” Got a “Clasp on the Vietnam medal.. “Operation Bold Mariner” sometimes in the summer of ’68 ‘Nam Cruise on the “Sweet Pea!! !” I wouldn’t trade those daze for all the tea in China!! I lived them along with all my compadres!!! PR-2 USN 05DEC66-23NOV70 Nam ’68, APOLLO X Pickup May’69. Yup we were there early AM’s I think it was 24 minutes from splash down to on the flight deck, fastest pick up to date…. somewhere’s around Pago Pago…. 2 Much FUN!!!!! Stafford, Cernan and Young!! Great Guys!!! And a word to the original memester (whom I believe is not the bloghost hereabouts) or anyone else: spelling and grammar: actually a thing. If you can’t spell, don’t meme. @$$cheeks flapping in the breeze on the internet = not such a good look.